In today’s busy world, scheduling time together, paradoxically, may well be the best way to keep your relationship thriving. 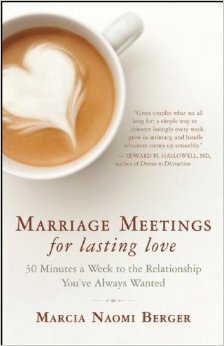 Marriage Meetings for Lasting Love: 30 Minutes a Week to the Relationship You’ve Always Wanted, tells step-by step how to reconnect with your spouse every week by holding a short meeting, using an agenda that covers all bases. Marriage meetings are a proven way to foster intimacy, romance, teamwork, and smoother resolution of issues. The book tells, step-by-step, how to conduct each of the four parts of the meeting and how to use positive communication skills that promote successful meetings. Detailed stories about how several couples benefited from holding the meetings are also included. The book is scheduled for release by New World Library in January, 2014. You can get it in paperback or as an eBook at Amazon, Barnes & Noble, or at your local independent bookstore.